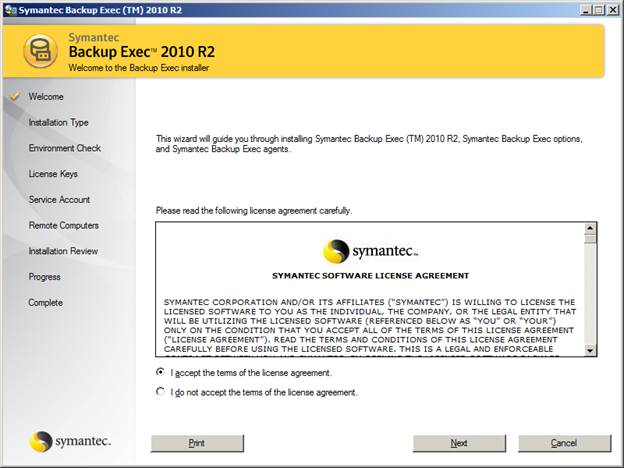 Download the installation package and purchase the License key from Symantec cooperation. The package may contain the installation guide and other details depending on your download. Memory: Required: 512 MB RAM, Recommended: 1 GB RAM (or more for better performance). Free space required: 1.44 GB (Typical installation) and 2.32 GB (Includes all options). Here are the steps to manage the installation. 1. In order to start the installation you need to double click on the 'Browser.exe' which will prompt you for the Language selection during the installation and you may be prompted with about 11 languages and here we are selected with 'English' for our installation. 2. After that, the introduction page will lead you to the various tasks that you can perform before the installation. Select the same as per your requirement and since this document is for Installation we will proceed for installation. So in order to go for the installation please select the option 'Install Products' and which may lead you to the below window. 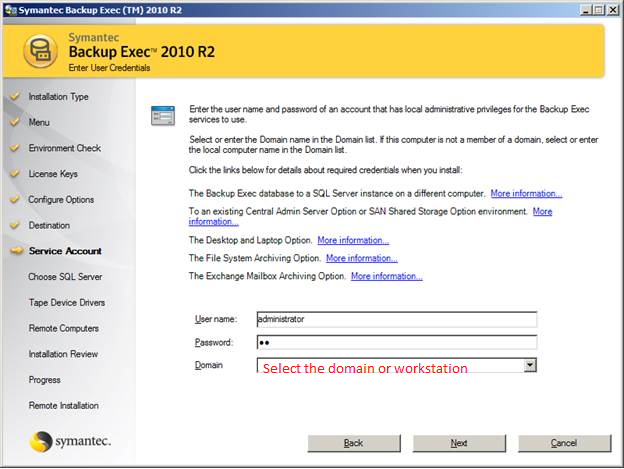 Go for this option when you want to set up a Backup server and manage it at the first time without this you cannot manage and install the other features too. This is the client agent that will help you for managing the backup of your client machines. 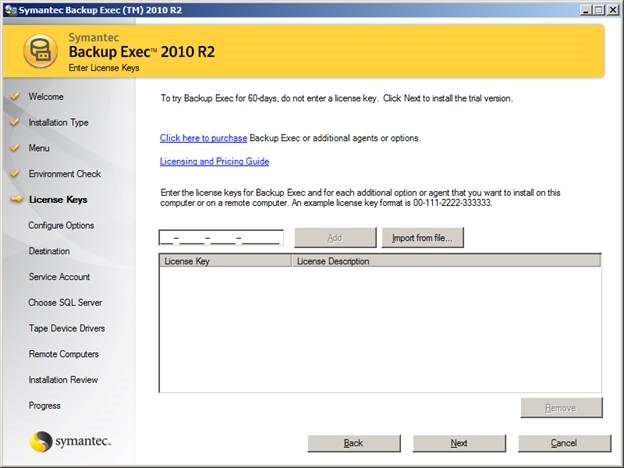 In order to create and restore the backups of client it is must to install the ‘Backup Exec Remote agent’ (Which is able to push from the server and install directly too). 4. 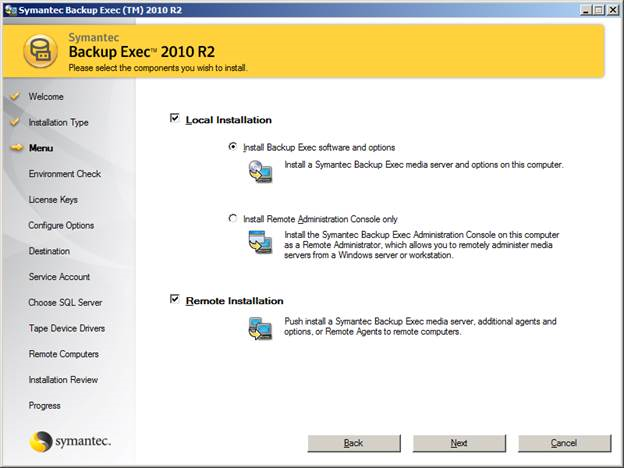 Here we are setting up the Backup server and all other services are related to that.So expand‘Backup Exec’ and select 'install' to start with installation process. 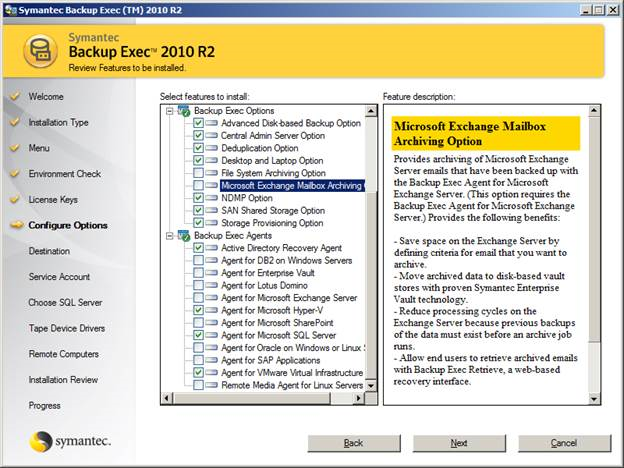 OR you can see the read me file which will help you to get more idea about Symantec backup 2010 and its added advantages. In order to view the read me expand the tree view and click on ‘Readme’. 5. Once you proceed with the installation it will provide you the details of ‘License Agreement’ read carefully and click on ‘Next’ to continue. 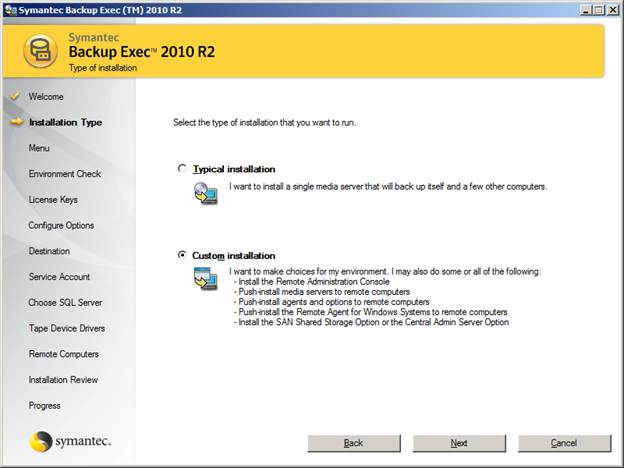 This will allow you to configure and install Backup exec with default settings and you don’t want to specify the installation and configurations. It is the advanced mode installation that you can mention and make the configuration as per your needs, In order to have a detailed description on the features we are selected here as ‘Custom installation’ and click 'Next'. 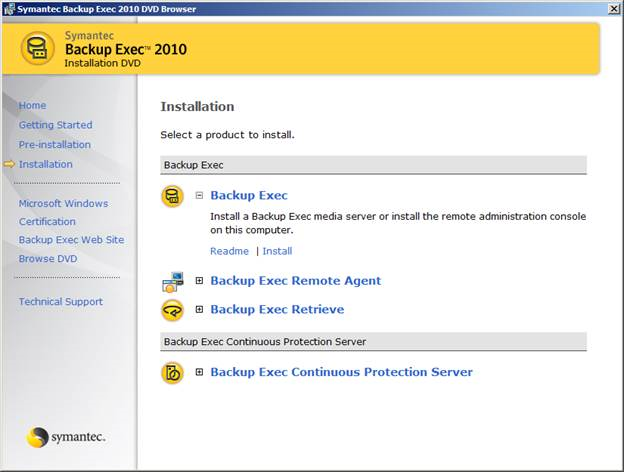 This is meant for your first time installation which will install and configure the administration console for your backup administration, always make sure that you have selected this feature if this is the first time installation of Symantec backup Exec in your network. This will enable you to administer the other clients in your network to respond with the Backup Exec actions (Remember that it will help you only to get the backup of your remote client). 8. 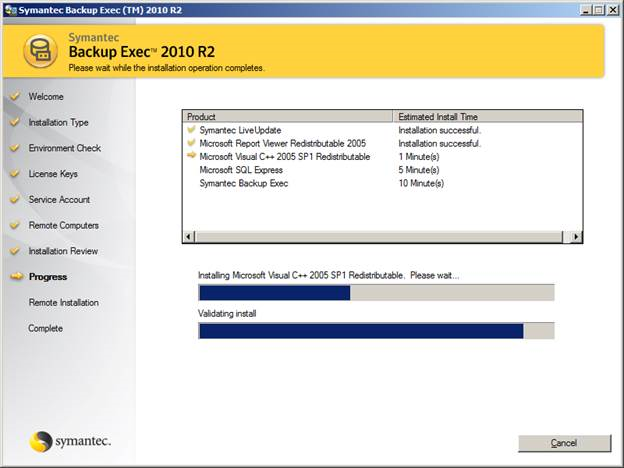 Now the Installer will validate your system and its configuration that is relevant for Symantec Backup Exec. Once the automatic system check completes go through the validations check and make sure that there is no errors reported. If anything found you need to correct it and then only you can continue with the installation, the warnings can be viewed and mark it down (You may need this to troubleshoot if you face a problem on further steps). 9. On next you must specify your product key. You can either type it or import this. Please mention the same as you needed. In order to get the Trial version (60 Days) you can click on ‘Next’ without entering the License Key. 10. 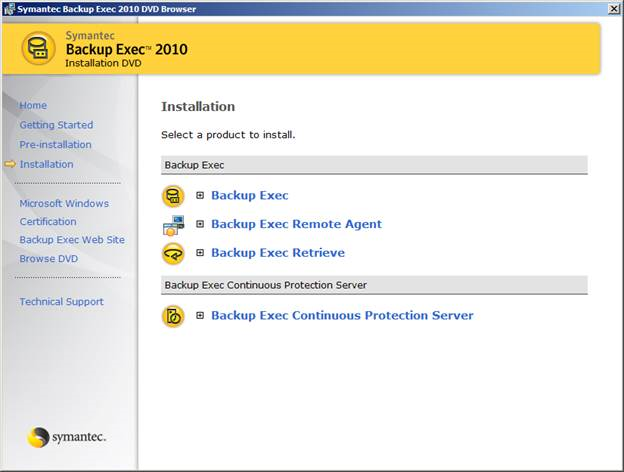 Here you need to specify the features that need to be installed with the Backup Exec. All these are optional and you must specify only those that required for you (Since the full back may contain all these it may increase the backup disk usage). 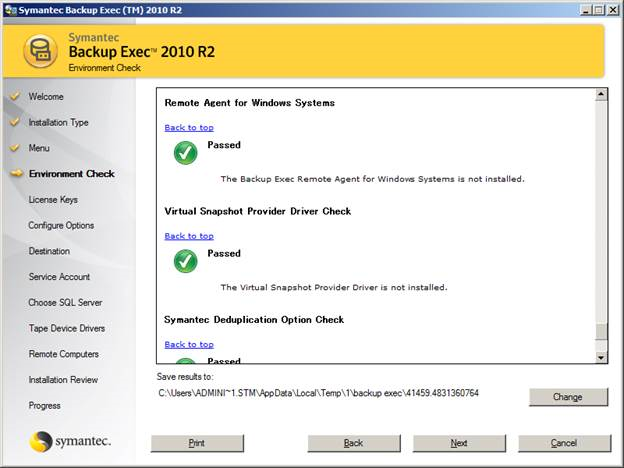 You have the backup of all your windows server features with your System state backup and the features to back up the same can be skipped. 11. 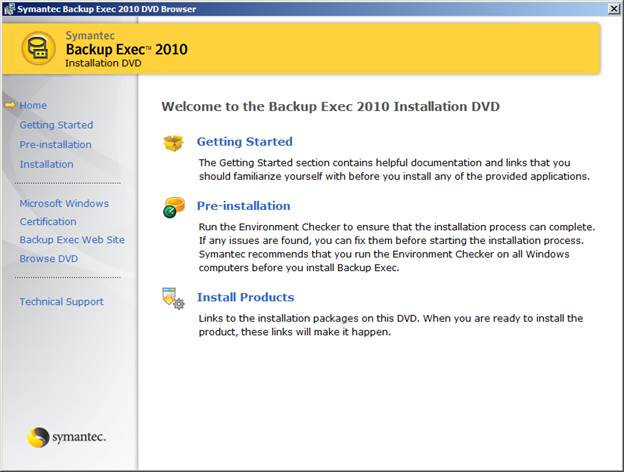 Now you need to specify the directory that where you want to install the Symantec backup Exec,By default the location will be ‘c:\Program Files\Symantec\Backup Exec’ (In the directory ‘c:\Program Files\Symantec’ is the location you will see all your other Symantec Products like antivirus and endpoint protection ) and you need minimum of 2GB free disk space for the product to be installed. Make necessary changes as per your needs. 12. Next you need to specify your system account that has administrator privilege to your domain (If your system is a member of a domain) or the local system user that has administrator privilege and password too. 13. If your username and password is correct and have proper privilege to make the changes in your Active directory you will receive the message as shown below. 14. 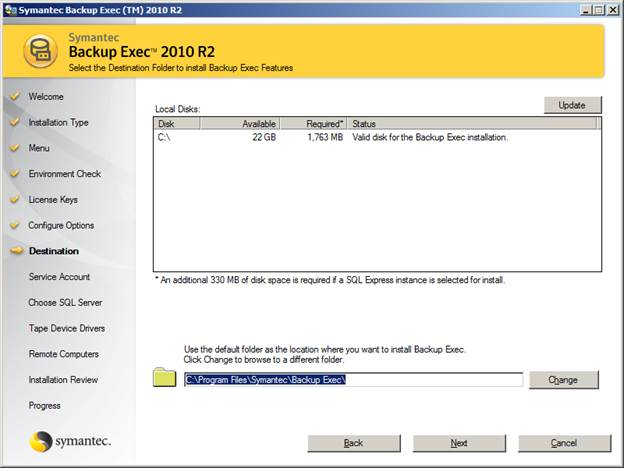 Symantec Backup Exec will have the database to store it data related to the clients and operations with the Help of SQL Express 2005 or 2008 Editions. You can either specify a new installation to create a new database and instance, since I don’t have a SQL server installed on my network I will go for this. Here you are creating the database on existing database. 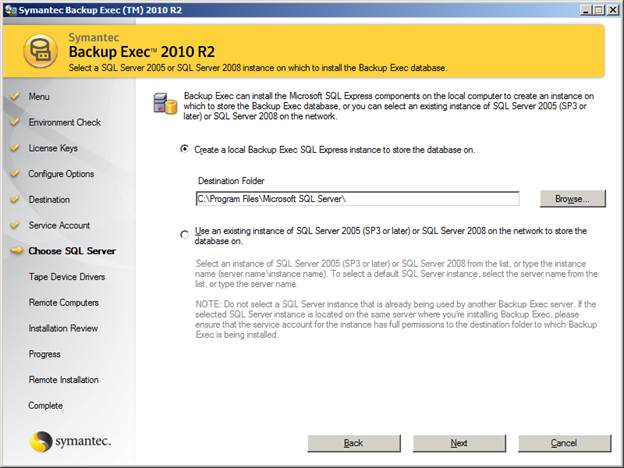 While promoting as Existing database you may be prompted with the instance name, user name and password to connect with the instance (Always make sure that the user that you specifies here have the necessary permission to modify the details in database or you may fail to complete the installation and your backup). 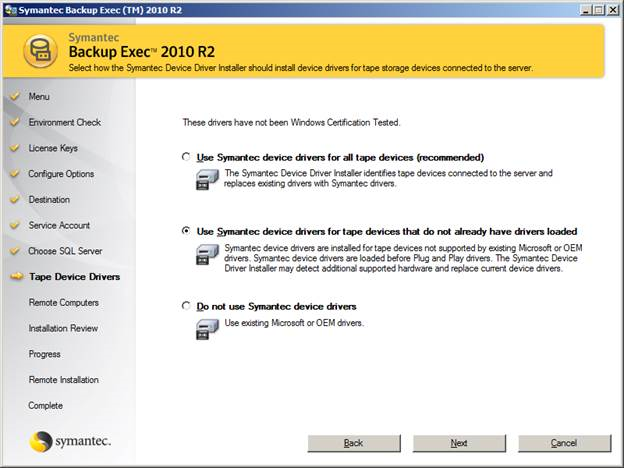 It is the recommended option from the Symantec and will help you to provide the device driver for all the tapes that we are going to use. The same will help you to give a device drives only for the tape that does not have the drivers installed and if the drivers are installed already it will keep updated with the existing driver itself. Always make sure that you have a separate device drivers for all the tape devices that you are going to use to have the backups. 16. Since we have given the Option to install the components for Remote computer backup administration the next window will prompt you for that. Here I am skipping the same and for more information is available within my site itself, make a search and will find more information about that. 17. Now the installation will start as per the configurations that we have specified and make sure that the all the five components installs successfully, If any of the components fails it will skip the complete installation. 18. Once the installation is success then it will show you the summery of installation and click on Finish to complete the installation steps.